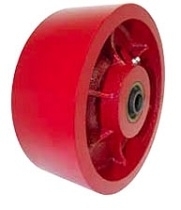 Ductile Steel Wheel, Red 10"x 3"
tread face. Precision & tapered bearings maximize mobility and performance in towing and severe use environments. Hard on floors and has a very high heat tolerance if used with high temp grease.